By detecting the faint dimming in the light emitted by stars during a transit event, CoRoT has detected six new exoplanets - each with its own peculiar characteristics - and one brown dwarf. One of these exoplanets, designated CoRoT-11b, has twice the mass of Jupiter and orbits a rapidly rotating star; this type of star is an extremely difficult target for exoplanet searches and its detection marks a significant achievement for the CoRoT team. In order to detect planets orbiting other suns, the CoRoT satellite, which is operated by CNES (the French space agency), observes a large number of stars over a significant period of time, trying to spot a subtle decrease in their luminosity: this 'dimming' could be a signature that the star hosts a planet, which is transiting in front of it and partially obscuring its light. This transit technique is one of several methods used to search for exoplanets but is the only one that allows astronomers to determine the radius of the planet - by measuring the depth of the transit. Other geometrical configurations of a stellar system, for instance the presence of one or more companion stars can, however, mimic the presence of a planet. For this reason follow-up observations are needed to confirm the planetary nature of the transiting body. Alerted by CoRoT's detection of a candidate planet-hosting star, some of the foremost ground-based observatories collect high-resolution images and spectra, yielding a wealth of additional information. In particular, astronomers look for a Doppler shift in the stellar spectrum, highlighting the periodic 'wobble' of the star in the two-body system. From the amplitude of this wobble, it is possible to estimate the mass of the transiting body and, consequently, to determine whether or not it is indeed a planet. Once the mass and the radius are known, the mean density of the planet can be derived – a key factor in distinguishing between gaseous giant planets and rocky terrestrial ones. The discovery of these six new exoplanets adds variety to the large number of exoplanets that have been detected to date. "With the addition of this new batch, the number of exoplanets discovered by CoRoT has risen to 15," says Magali Deleuil from Laboratoire d'Astrophysique de Marseille, Head of the CoRoT exoplanet programme. "The increasing size of the census, which includes objects with very diverse characteristics, is of vital importance for a better understanding of planetary systems other than our own," she adds. The new discoveries exhibit a wide variety of physical properties, spanning a broad range of sizes and masses: the smallest of the sample, CoRoT-8b, is about 70% of Saturn's size and mass, while CoRoT-10b, CoRoT-11b, CoRoT-12b, CoRoT-13b and CoRoT-14b are larger, belonging to the class known as 'hot Jupiters'. CoRoT-15b, being 60 times as massive as Jupiter, is a brown dwarf, an intermediate object between a planet and a star. In addition, other peculiarities are exhibited in this very heterogeneous set of exoplanets: CoRoT-10b has an extremely eccentric orbit, resulting in large variations in its surface temperature over the course of its year, and CoRoT-11b's parent star spins around its axis at an extraordinarily fast rate. "The rich diversity emerging from this sample is a very interesting result, showing CoRoT's ability to detect exoplanets which are rather different from each other", comments Malcolm Fridlund, ESA's Project Scientist for CoRoT. "Being able to study a wide variety of planets will provide important insights into the formation and evolution of planetary systems", he adds. One of the planets, CoRoT-11b, stands out from the set of six because of the rotation velocity of CoRot-11, its parent star, which spins around its axis in less than 2 days - an exceptionally high speed, as compared to the Sun's rotation period of about 26 days. "This is the third exoplanet discovered around such a rapidly rotating star", notes Davide Gandolfi, the ESA Research Fellow who led the study of CoRoT-11b. "Because of the fast rotation of its host star, such a planet could only have been discovered because it transits in front of it, thus only a transit-hunter, such as CoRoT, could have spotted it", he adds. The search for Doppler shifts in the spectra of stars, which represents another prolific method for detecting exoplanets, is in fact biased against planets orbiting fast rotators, as the high rotational velocity of the star makes it extremely hard to achieve high-precision Doppler measurements and hence to detect the tiny signature of the presence of a planet. "If it had been included as a possible exoplanet candidate during such a campaign, CoRoT-11b would have been rejected because of the intensive observational effort needed to achieve the required accuracy", explains Gandolfi. Instead, the object was first noticed by CoRoT, and then became the subject of extensive photometric and spectroscopic follow-up observations across the world, using the Swiss Leonhard Euler 1.2 m telescope at ESO's La Silla Observatory and the TEST 30 cm telescope at the Thüringer Landessternwarte Tautenburg, as well as a number of world-class spectrographs (HARPS at ESO's La Silla Observatory, SOPHIE at the Haute-Provence Observatory, UVES at ESO's Very Large Telescope and HIRES at the Keck Observatory), and the high- and low-resolution spectrograph also at Tautenburg, in Germany. Thanks to the combination of these exceptional data, it was possible to estimate the mass of CoRoT-11b, which is about twice as massive as Jupiter, and its radius, which is about 1.4 times that of Jupiter, thus confirming its planetary nature. Above: The complete lightcurve of CoRoT-11 for the period 15 April to 7 September 2008. Right: The folded lightcurve, showing the amplitude of the transit. Images courtesy of D. Gandolfi. "This result anticipates what may be achieved by future space-based missions searching for exoplanets", says Fridlund. CoRoT is in fact a precursor for PLATO, a Cosmic Vision candidate mission that will seek planetary transits over a much larger sample of stars - the size of the sample is an important factor determining the number of planets that may be discovered. This significant increase in the sample size is possible because of PLATO's very wide field of view, which in turn relies on the combined use of 34 small telescopes. In addition, PLATO will study brighter stars than those that can be observed with CoRoT, making it possible to determine the age of the planet-hosting stars through asteroseismology measurements. This, combined with the tremendous improvement in the accuracy on the estimate of exoplanet masses and sizes that is expected from PLATO, will provide an important step in the quest to understand the conditions that favour the formation of Earth-like planets. Since 1995, astronomers have discovered over 450 exoplanets by employing a number of techniques, including astrometry, radial velocity and the transit method. Of the 82 planets that have been discovered using the transit method, 15 were first spotted by CoRoT. 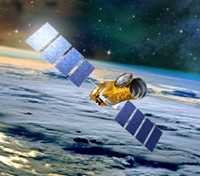 The CoRoT satellite has been developed and is exploited by the French national space agency, CNES, with significant participation from Austria, Belgium, the European Space Agency (ESA), Germany, Spain, and Brazil. ESA has joined the mission by providing the optics and baffle for the telescope and testing of the payload. Through this collaboration a number of European scientists, from Denmark, Switzerland, the United Kingdom and Portugal, have been selected as Co-Investigators in open competition. As a result of ESA's participation in CoRoT, scientists from ESA's Member States also have access to the satellite's data. 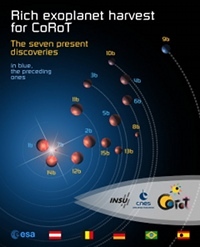 ESA's Research and Scientific Support Department (RSSD) at ESTEC is a full partner in CoRoT by providing the on-board Data Processing Units (DPU's). The ESA PRODEX programme has supported the development of the CoRoT telescope baffle, and the software development and data processing of CoRoT light curves. The ground stations used for CoRoT are located in Kiruna (S), Aussaguel (F) Hartebeesthoek (South Africa), and Kourou (French Guyana), with mission-specific ground stations in Alcantara (Brazil) and Vienna (A). A number of ground-based telescopes support CoRoT observations and contribute to the characterization of planets: the Canada France Hawaii Telescope, Hawaii, USA; the IAC80 and the ESA-OGS of Teide Observatory, Spain; the 1.2 m telescope at Observatoire Haute Provence, France; the Swiss Leonhard Euler 1.2 m telescope, Chile; the 46 cm and 1 m Wise Observatory, Israel; the 2 m and 30 cm TEST telescopes of Tautenburg Observatory, Germany; the BEST and BEST2 telescopes of the Deutsche Luft und Raumfahrt Gesellschaft (DLR) HARPS spectrograph on the ESO 3.6 m telescope, Chile; the UVES spectrograph on the ESO 8.2 m Very Large Telescopes at Paranal Observatory, Chile; the HIRES spectrograph on the 10 m KECK telescope at Hawaii, USA, the SOPHIE spectrograph on the 1.93 m telescope at Haute Provence Observatory in France; the Sandiford spectrograph on the 2.1 m telescope at McDonald Observatory in Texas, USA; and the AAOmega multi-object spectrograph on the 3.9 m telescope at the Anglo-Australian Observatory. Gandolfi, D., et al., "Transiting exoplanets from the CoRoT space mission XII. CoRoT-11b: a transiting massive 'hot-Jupiter' in a prograde orbit around a rapidly rotating F-type star", submitted to Astronomy and Astrophysics.